Dr. O and I usually get an itch to travel in the summer, and this summer was no exception. Last month, we packed up and headed down to Rancho Pescadero, a hip slice of paradise on the Pacific coast of Baja California. While I was awfully excited about spending time at the pool and the beach with my sweetie, I have to admit that I was most excited about the food. 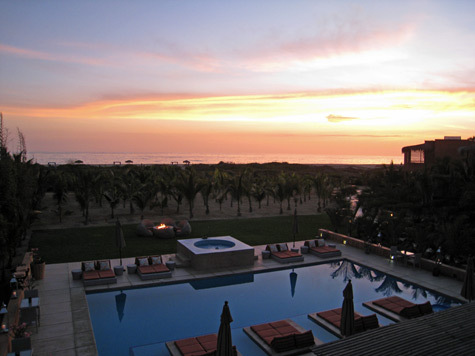 I had heard amazing things about the resort chef, Rodrigo Bueno (yes, really, his name is Chef Bueno), who had moved on to Rancho Pescadero after a stint at One & Only Palmilla (which we visited in April, coincidentally). His dishes center around super fresh local seafood and produce pulled from Rancho P’s on-site organic garden, so I knew we were in for a treat. We sampled a number of amazing dishes in the restaurant, including an unforgettable corn and panela cheese salad, shrimp risotto, halibut in coconut-tamarind broth, rib eye with salsa verde, roasted chicken, and Thai curry. While dinners were divine, some of my favorite food at the resort came poolside. Fish tacos, chicken tinga stew burritos, shrimp quesadillas, guacamole and salsa… All were beautifully presented and beyond delicious. How’s this for a view from the dinner table? As Dr. O and I were lounging the afternoon away at the pool with yet another order of the best ceviche either of us had ever had, Chef Bueno came around with samples of a mango-chile sorbet. While we enjoyed our frozen treat, Dr. O told Chef Bueno how much he enjoyed the ceviche and that he wanted me to try to make some after we returned home. On the spot, Chef Bueno offered us a cooking class at 5 p.m. that day so I could learn just how he does it. Pretty cool, right? We showed up and I got to work under Chef Bueno’s gentle guidance. (Dr. O decided to take on the all-important job of photographer and chief taster.) As a perfectionist, I’ll admit to being mildly frustrated by the process of making ceviche. My knife skills are less than perfect, and there was quite a bit of intricate knife work. (With all the slicing and dicing, Chef Bueno says to give oneself 90 minutes to make ceviche for 10 people.) Also, I tend to be a by-the-book recipe follower, and making ceviche is more of an intuitive process. 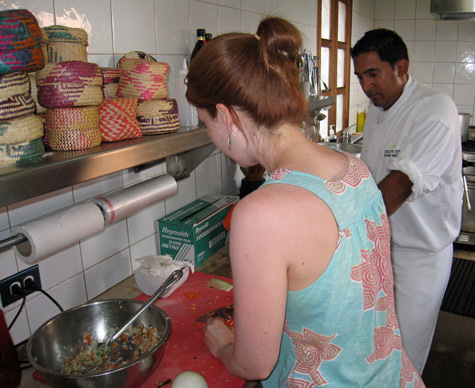 Still, I had a great time in Chef Bueno’s kitchen; the cooking class was a highlight of the trip for sure. And my ceviche might not have been gorgeous, but it sure was delicious. After we finished our class with Chef Bueno, Dr. O and I took notes about what we learned. This is the recipe according to my notes and memory. (Chef Bueno, if you read this, feel free to correct me!) Go with the flow and adjust ingredient quantities to taste… The end result will be worth it! Cut the halibut into 1/4-inch slices. Cut each slice into 1/4-inch strips and then cut crosswise to finely dice the fish. Place the fish in a small bowl. Squeeze the limes over the top of the fish. Transfer the fish and lime juice to a plastic bag. Seal and refrigerate for 30 minutes. Meanwhile, finely dice the tomatoes and onion and place in a large bowl. Using your knife, remove several wide lengthwise strips of skin from the cucumber. Cut the cucumber lengthwise into 1/4-inch slices, avoiding the center (seeds). Cut each slice into 1/4-inch strips and then cut crosswise to finely dice the cucumber; add to bowl. Gently stir the mixture to combine, checking for balance of ingredients. (If you need more red, add tomato; if you need more green, add cucumber, etc.) Chop the cilantro and mince the serrano pepper and add to the bowl. Add a splash of Clamato, drizzle with olive oil, and season with salt and pepper. At the end of the 30 minutes, add the fish and lime juice to the ingredients in the bowl. Season again with salt and pepper to taste. (This step is important since the fish was not previously seasoned.) Transfer ceviche to serving dish. Peel, pit, and thinly slice avocado; arrange over ceviche. Serve with chips, preferably poolside! This ceviche is heavenly. It’s fresh and limey, with great texture from the onion and cucumber, and a hint of heat from the serrano. I could eat it every day (and practically did during our time at Rancho P). Thanks, Chef Bueno, for tasty food and a great experience! The quality of the fish you use plays a huge part in the recipe’s success. All you coastal people have a definite advantage. In Colorado, our best shot at fresh fish is river fish; Chef Bueno said this recipe definitely would work with trout. 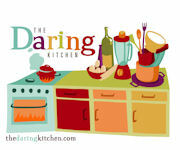 He also suggested having fun with the ingredients based on what you have and what’s in season. Adding mango and coconut milk (and subtracting the Clamato, I assume) is one variation we discussed. TIPS: Don’t over-marinate the fish, as it will become chewy. Also, once the fish is marinated and the ceviche is assembled, be sure to serve it within about four hours for best taste and texture. 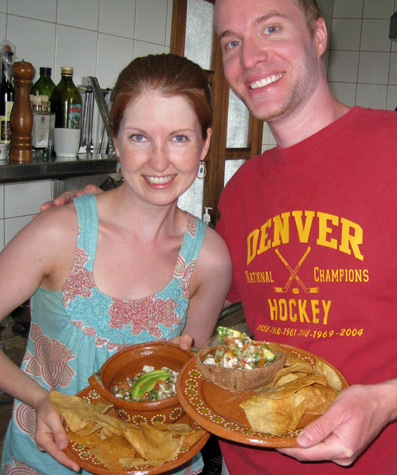 Curious about how ceviche “cooks” and how to select the best fish? Check out this helpful article.